In 10 years, the NDWA has organized an unstoppable movement powered by one of the most potent forces for change in the world - love. Many NDWA members have been affected by the political changes in the US like increased deportation and more visible demonstrations by white supremacists. However, we still have a lot to celebrate from our partnership with the IDWF to winning Bills of Rights in the 8 states. 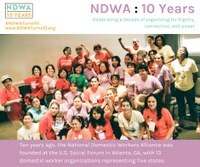 NDWA had two events honoring our legacy in Atlanta, Georgia and Durham, North Carolina. The We Dream in Black NDWA chapters in those cities won Dorothy Bolden Day who built the first national Domestic Worker Union in the 1960’s.